Pupils from Selworthy School in Taunton are enjoying a new outdoor space, thanks to a collaboration with the Westcountry Rivers Trust. The co-educational special school for children and young people with learning disabilities worked with the environmental charity to create a rain garden. The rain garden was created primarily to address flooding, which often prevented pupils from accessing the school grounds and sometimes impacted on emergency access to the site. Developed on a grassy field, the rain garden channels surface water and captures it in one designated area, creating a pond when it rains. With scented and edible plants that provide a range of colours and textures, the garden includes a decked platform and balance logs. After securing funding from the Postcode Local Trust, the Westcountry Rivers Trust designed and built the garden with input from students, parents and teachers. 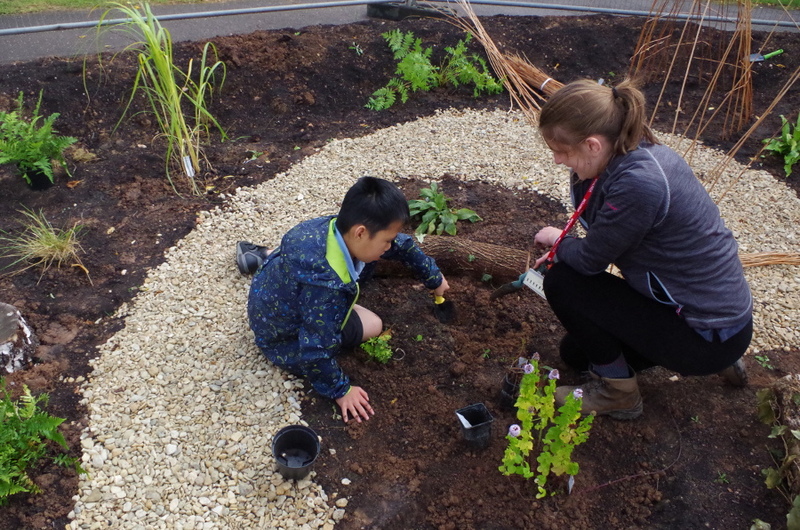 Pupils aged four to 19 are now enjoying the space, with sixth form pupils taking responsibility for tending the plants. Cameron Merry, Fundraising Lead at Selworthy School, said: “Here at Selworthy, school is about far more than our four walls. Our ethos is to take education to our pupils, so they can learn in the environment that is right for them. That means it is extremely important to us to have a good outdoor space that is suited to learning. However, our field often got wet and muddy, which caused anxiety among many of our pupils. Flooding was such an issue that our pupils were often unable to go outdoors. Kathi Bauer from the Westcountry Rivers Trust said: “It has been a wonderful experience to work with Selworthy School. The students, parents and teachers were enthusiastic and creative and we would not have been able to design a space with the same effect without their fantastic ideas and contributions. Working with them has been a fantastic experience and also a lot of fun. The Westcountry Rivers Trust is now working with two more Taunton schools, Holway Park Community Primary School and Lyngford Park Primary School, to create rain gardens. These projects are funded through the Ingenious Grant from the Royal Academy of Engineering. The project aims to inspire children, especially girls, so see engineering as a creative career with a big impact on society by allowing them to be part of the design and creation of rain gardens together with engineers from academia and industry. The charity is also collaborating with the Friends of Longrun Meadow to improve drainage in this popular green space on the edge of the city and improve the quality of water reaching the River Tone. These projects are part of the SPONGE2020 partnership that focuses on improving the adaptation capacity of cities and densely-built areas in the 2Seas region by co-creating innovative climate change adaptation solutions with local stakeholders.